Lotus stem is a calorie dense vegetable as it is the storage organ of the lotus plant, but it is very high in iron and should be consumed regularly. In fact the lotus stem being calorie dense is not a problem at all as it is so full of fiber that it becomes a low GI food. Also, if we consume calorie dense veggies smartly, with more high fiber and low calorie accompaniments it becomes an enjoyable meal packed with all the goodness any nourishing food can have. Lotus stems are good for you, rich in Vit C, minerals and Vit B6 too. A good antioxidant booster and fit for detox diets to. Good enough reason to eat this ugly looking vegetable which transforms to a beauty when chopped n cooked. 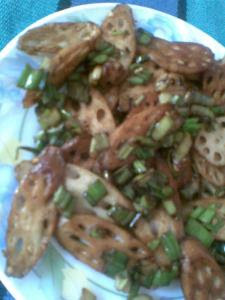 I cook lotus stem in many ways I love it so much, all healthy recipes for sure. I like the taste and the texture it provides to curries and salads. I am yet to try a raw lotus ste alad but soon I am planning to get some really fresh lotus stem and do a raw salad with it. The mature lotus stems have very high fiber content, so when buying take care that thicker and longer sticks are the best for you if you want it healthier for weight loss. This stir fry recipe is a quick one which I follow for many vegetables with decent results. Just chop the lotus stems in roundels and stir fry in 1 tsp of oil. Throw in some chopped spring onions, salt n pepper and stir fry till it appears half cooked and glazed. Add in a dash of soy sauce followed by green chilly sauce. May be a dash of mirin, stir well and it is ready. Sprinkle toasted sesame seeds over it if you wish. Enjoy this stir fry as a salad or with a rice and chicken kind of meal of just wrapped in chapatis. I love it with my multigrain rotis too. Oh wow-an award for me!! That's really sweet of you :-)Am I supposed to give it others?I'm new to this,so please enlighten me! !